← UNDENIABLE TRUTHS FOR ALL TIME! July 3, 2015 By Jack Jodell. Tomorrow, July 4, marks the 239th anniversary of the signing of our Declaration of Independence. 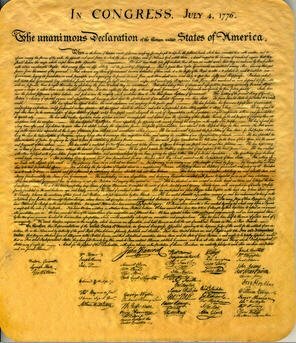 It was, and still remains, one of the greatest and most inspiring documents ever created by humankind. A long and bloody successful Revolutionary War soon followed, after which our Constitution was drawn up and the United States of America was proclaimed to be an independent Republic. This Constitution has been amended 27 times since its adoption, (the first 10 being known as our precious Bill of Rights), guaranteeing that our government would remain flexible, relevant, and dedicated to the good of its people (and not merely its business community) for its entire existence. The Declaration of Independence provided a framework for what our country was founded upon, and laid the groundwork for the shaping of the constitution. 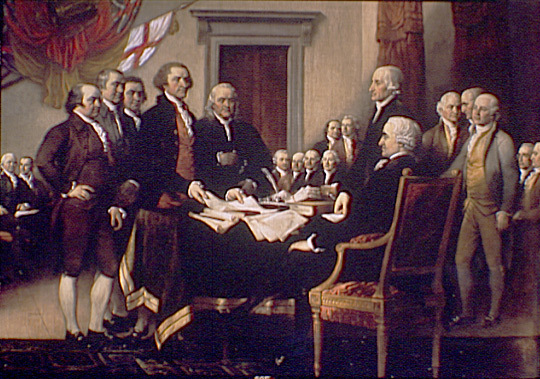 This ingenious document states, “We hold these truths to be self-evident, that all men are created equal, that they are endowed by their Creator with certain unalienable Rights, that among these are Life, Liberty and the pursuit of Happiness.–That to secure these rights, Governments are instituted among Men, deriving their just powers from the consent of the governed,–That whenever any Form of Government becomes destructive of these ends, it is the Right of the People to alter or to abolish it, and to institute new Government, laying its foundation on such principles and organizing its powers in such form, as to them shall seem most likely to effect their Safety and Happiness.” I wonder if uber capitalists like the Koch Brothers, Sheldon Adelson, Mitt Romney, Donald Trump and the like ever stop to think for even one minute how their actions and policies are often seriously detrimental to the pursuit of happiness sought by those whom they employ and exploit? Or, in their minds, is it only the pursuit of their individual happiness, and no one else’s, that really matters? The Declaration goes on to list a long list of grievances against the King of England, who was then their lord and master, and pointed out how it is their duty, as afflicted and ignored subjects, to rise up and abolish the form of non-representative government which had been imposed upon them by the British. This is completely reasonable – a nation or group of people are certainly entitled to their own self-governance to ensure they are fully free to choose their own desired path to happiness – provided that their path doesn’t infringe upon or negate the happiness of others. 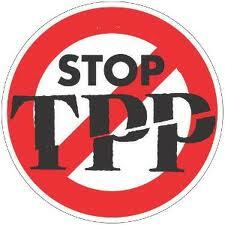 As I think of the proposed Trans Pacific Partnership (TPP) and all its sister “free trade” agreements which will surely be enacted after its passage, I am alarmed at how totally un-Declaration of Independence, unconstitutional, and wholly un-American they really are. Will we allow a secret tribunal of corporate lawyers to overturn laws passed by OUR Congress for OUR benefit and OUR safety, just so THEIR corporations’ profits won’t be damaged? Will we allow these bastardly tribunals to award millions and maybe even billions of OUR dollars to foreign corporations which WE will then have to pay for out of OUR pockets? If this horrible bill gains final passage and becomes law, our democracy will have been thoroughly subverted to corporate interests – our sovereignty will be completely surrendered and gone forever! What was originally a nation built upon laws and ostensibly for the common good of its citizens will then have become a nation built solely upon corporate profit. Is THIS what our Founding Fathers had in mind for the republic they created? Hardly. Is THIS what our brave soldiers sacrificed their lives for in the Revolutionary War, the Civil War, World War I, World War II, Korea, or the Gulf Wars – to become subject to the dictates of greedy multinational corporations? DEFINITELY NOT!!! Perhaps to billionaires with vested interests like the 1% minority Koch Brothers, this may seem like a Libertarian dream come true – but to all the rest of us – the 99% MAJORITY – it represents utter TYRANNY! Please think about this over the 4th of July weekend, and even beyond. 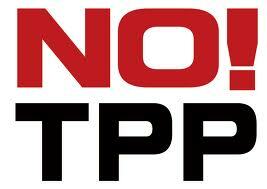 I strongly again urge you to CALL YOUR SENATORS at 202-225-3121 and tell them to vote NO on TPP! You owe this to your fellow citizens and to all those before us who have fought and died for our liberty! Thank you, and keep pushing forward! This entry was posted in corporate greed, Mitt Romney, the 1%, THE MAJORITY 99% and tagged Bill of Rights, Civil War, Constitution, corporate tribunals, Declaration of Independence, Donald Trump, Gulf Wars, Korea, loss of sovereignty, pursuit of happiness, Revolutionary War, Sheldon Adelson, The Koch Brothers, TPP, Trans Pacific Partnership, ubercapitalists, World War I, World War II. Bookmark the permalink.